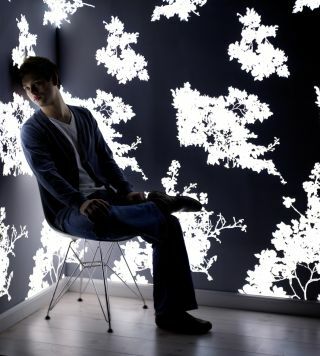 An enterprising young designer from the Netherlands has invented what has to be the ultimate in home illumination – light emitting wallpaper. The luminescent wallpaper is the brainchild of Jonas Samson, who designed and submitted it as part of his final-year postgraduate degree. "The base material is made from a commercially available product that’s manufactured by a number of companies. What I have done, though, is to apply that technology in a different way." "The back layer is a silver-based solution that conducts electricity, while the layer above this contains phosphorous pigments that light up. On top of this is a flexible, transparent ITO conductor layer, with regular wallpaper placed on top to act as the final, outwardly visual layer," he explained. The result, when it’s switched on, is a visually stunning wall-of-light that can be turned off and on, just like a regular light. Although Samson first revealed his creation to the public last year, this year’s upcoming Salone Internazionale del Mobile interior design show in Milan, where he is exhibiting, looks set to make his creation a must-have for those who can afford it. Ah yes, the price… Well, given that everything is designed from scratch and made to order, there are no set costs for installation of Samson’s light-emitting wallpaper. That said, Samson told us that 6,000 euros could be considered a basic "starting price".